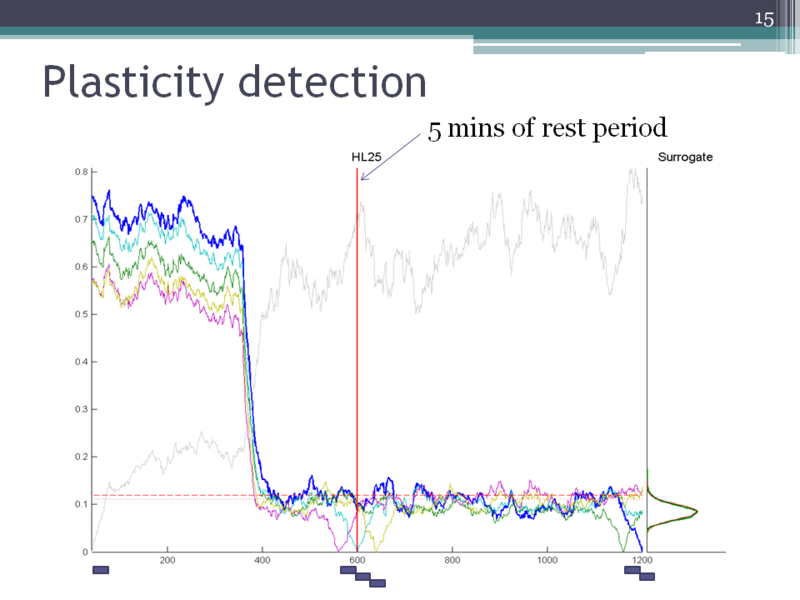 One of the slides from the presentation (long term plasticity). Y axis is divergence of a moving window to the fixed window of data indicated as the dark boxes below. Unfortunately, I will not be presenting the paper myself, but fortunately my advisor Jose C. Principe will be. It’s going to be presented during the special session SS-L2: Multivariate and Multimodal Analysis of Brain Signals, Room A3, Tuesday, March 16, 1:50 pm. Please visit my colleagues’ presentations and posters as well. Nice post! It reminded me that I should also wrap up a toolbox with my code some day. is it a plasticity result? sounds to me the stimulus just kills or run-down the neurons. :p any other evidence that this is THAT case? I didn’t really show the activity of the culture here, but they are still alive and firing after that change. Remember what I am plotting is not the firing rate or activity, it is the change in statistics. It is probably not a simple synaptic plasticity that we usually expect, but it was as if the whole system went into a new dynamic state. There’s always a possibility that this was a chemical process that damaged some neurons, so your point is valid. This culture was alive for days after the experiment.